An archer is not an archer without his bow and arrow. In order to progress as an athlete, every archer must learn their equipment including the basic parts that make a bow and arrow. Our local archery experts here at Triggers and Bows have put together this useful guide to help you become a better archer by sharing everything you need to know about the parts of a bow and arrow. Let’s start with the anatomy of a bow, which includes four basic parts. The riser is the centre piece of the bow that the upper and lower limb attach to. This can be made of a composite or wood and has three main features: the grip, sight window and arrow rest. The grip is the curved portion of the riser that is made for your hand to “grip”. Different sizes of risers will have differing grip sizes, so make sure you feel the grip before you purchase the bow. The sight window is the cutout just above the grip. This cutout is the area that you should generally be looking through when aiming your bow. Most bows only have one sight window, but some bows have a sight window on either side of the riser. The arrow rest usually attaches inside the sight window and allows the arrow to sit suspended and freely clear the bow when fired. Arrow rests can be built as part of the riser, or a separate piece that can be attached. The two limbs that attach to the riser are the upper and lower limb. These limbs are not interchangeable and must be attached to the proper end of the riser to function properly. Limbs can be made of several different types of materials including wood, composites or metals. They are also generally laminated with fiberglass or similar materials. At the tip of each limb is a groove called the string nock. This groove is cut into the limb to allow each end of the bow string to loop around and attach to the bow. The bow string attaches to each end of the limbs by a small loop and can be made of various materials. To keep bow strings in good condition, they are rubbed using a silicone based wax. The two main parts to a bow string are the center serving and the nocking point. The center serving is typically a type of thread that is wrapped around the middle point of a bow string. This wrapping allows for increased durability in the area where the arrow will be nocked. The nocking point is a point on the string that indicates where an arrow should be nocked. It’s generally made of brass or similar materials and crimpled onto the string. Arrows should be nocked directly below the nocking point. Now that you’ve learned about your bow, let’s look at the four basic parts of an arrow. The point is at one end of the arrow shaft. This is the part of the arrow that will come in contact with your target first. There are three basic types of arrow points that most archers know of: the bullet/field point, the blunt point and the broadhead. 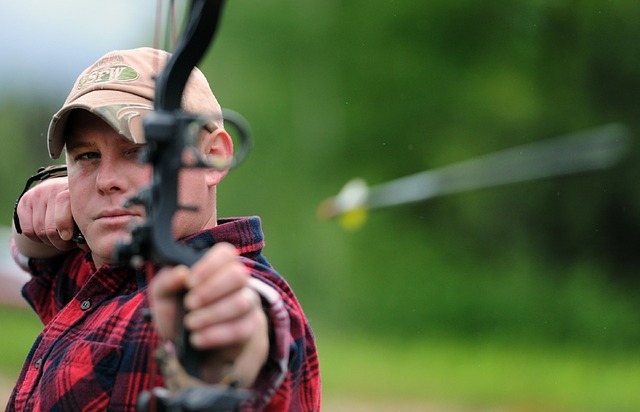 The bullet/field points are the most commonly used points for practicing archery at a range. They are basically a pointed metal tip that you can screw onto the end of your arrow shafts. The blunt point is similar but instead of coming to a point at the end, it is blunt. This type of point is typically used to hunt small game such as rabbits or squirrels. Finally, the broadhead is the typical point that you see on arrows in cartoons and movies used to hunt large game such as deer or elk. The arrow shaft is the backbone to the arrow. It is long, cylindrical and has a spot for all of the other parts to attach to. Most arrow shafts are made of wood, aluminum or carbon. The three feathers, or feather-looking pieces, that you see attached to the sides of the arrow are called fletching. They are attached opposite to the point and must be attached in a specific manner to allow for optimal arrow flight. The fletch that is a different colour is known as the indicating fletch, which will point outward when the arrow is properly nocked. The nock is the v-shaped groove, or plastic piece, that is attached to the end of the arrow. It is on the opposite end of the arrow from the tip, and is next to where the fletching is attached. The nock is typically made of plastic, and made to be removed for repairs. Now that you’ve learned some basic information about your bow and arrow, you’re ready to become a better archer and kill it on the range! 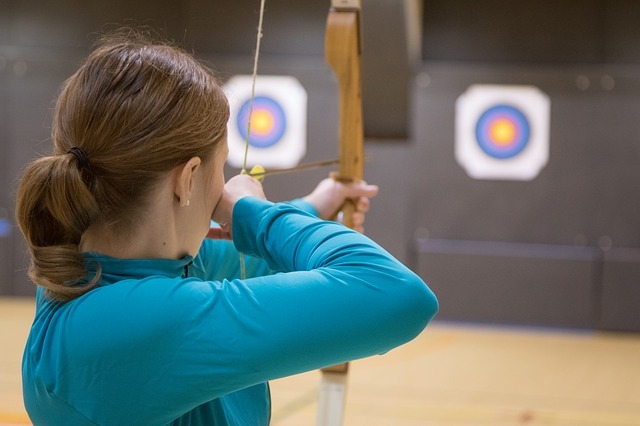 Do you want to learn more about your archery equipment, participate in an archery league or lessons or visit our state-of-the-art archery range? Call Triggers and Bows today at 519-449-1001 or come visit us at 340 Bigshopsgate Rd. in Burford, just a short drive from Brantford, Simcoe and Woodstock.